Cholesterol is an essential molecule found in all animals and is a structural component of animal cell membranes. It is the reason why animal cells are flexible and animals can move, unlike plant cells which have rigid cell walls. Cholesterol is a sterol and the cells in your body synthesize about 1 gram every day. 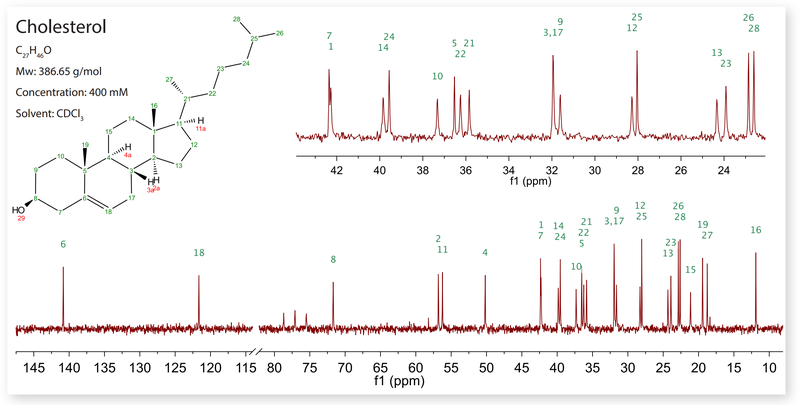 With recent advances in the performance of benchtop NMR, such as the 80 MHz Spinsolve 80, it is interesting to see the 13C NMR spectra from molecules such as Cholesterol. With a molecular weight of 386 g/mol and 27 carbon atoms it is a larger molecule than is typical measured on a Carbon-13 capable benchtop NMR spectrometer. Because there are more peaks to resolve, both the sensitivity and resolution of the instrument are tested with this measurement. The 1D proton-decoupled 13C NMR spectrum of a 400 mM sample of Cholesterol measured by a Spinsolve 80 is shown in the figure below. Because 13C has a lower gyromagnetic ratio than protons, the 13C Larmor frequency is 20 MHz. The region between 20 ppm and 45 ppm has been expanded to show how the carbon peaks are resolved.